New neutron “fingerprints” discovered with polarized gamma-rays at Duke could be the foundation for new port security scanners. Graphic: Ashley Yeager, Duke. Two teams of North Carolina physicists are mapping the intricacies of the atomic nucleus, which could provide better security at the ports. The scientists have identified new “fingerprints” of nuclear materials, such as uranium and plutonium. The fingerprints would be used in new cargo scanners to accurately and efficiently identify suspicious materials. The physics might also be used to improve analysis of spent nuclear fuel rods, which are a potential source of bomb-making materials. Ahmed said these fingerprints could eventually be used to distinguish special nuclear materials, like weapons-grade uranium, from naturally occurring uranium or ordinary objects such as clothing or granite countertops, distinctions that current port scanners cannot make. Ahmed and his colleagues are developing the fingerprints for the next-generation detectors with HIGS, the High Intensity Gamma-Ray Source. It is the world’s most intense and tunable source of polarized gamma rays and is located on Duke’s campus as part of the Triangle Universities Nuclear Laboratory. HIGS produces gamma rays that are guided to collide with target materials, causing a variety of nuclear reactions. In a separate but related project, nuclear physicists from three North Carolina universities are slamming the HIGS beam into atomic nuclei and observing the energy pattern and distribution of the gamma rays that fluoresce back out of the collision. Each material has a distinct fluorescence pattern based on its nuclear structure, according to physicist Calvin Howell, who leads the Duke group. Howell and his collaborators are studying the fluorescence patterns of potentially dangerous nuclear materials and non-nuclear contraband such as explosives and drugs. They are also identifying the patterns of steel and lead because terrorists can use the metals to conceal and ship weapon-making materials. The two anti-terrorism projects were developed with the support of the Department of Homeland Security’s Domestic Nuclear Detection Office, or DNDO. The agency awarded Ahmed and his colleagues a $2 million grant, while Howell and his collaborators received grants totaling $2 million. DNDO is funding both projects in response to the SAFE (Security and Accountability For Every) Port Act of 2006, which requires security agents to scan for nuclear materials in all of the containers entering the United States through the nation’s 22 busiest ports. The Duke scientists say their use of polarized gamma-ray beams could one day help satisfy the SAFE policy, and they are building the fingerprint library to make it happen. The HIGS data show, for example, that a precisely tuned gamma beam at 6 MeV causes weapons-grade uranium, U-235, to emit one neutron parallel to the polarization plane for each neutron emitted perpendicular to the plane, giving the material a neutron fingerprint of one. 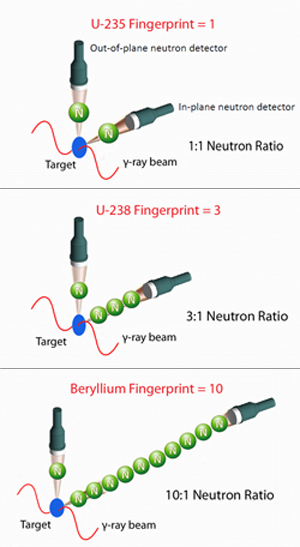 Naturally occurring uranium, U-238, emits three parallel neutrons for every one emitted perpendicular to the polarization plane of the beam, giving it a neutron fingerprint of three. Beryllium, which can also be a neutron source in nuclear weapons, has a neutron fingerprint of 10. The team is now measuring the neutron fingerprints of plutonium and other fissile materials, Ahmed said. Howell and his collaborators, meanwhile, work at lower energies on HIGS, about 3 MeV. (Surgeons, for comparison, use a “Gamma Knife” at roughly 1 MeV to treat brain tumors.) Their team has already identified the fluorescence patterns of several special nuclear materials and lead. Ahmed and Howell said that engineers at one private security company and scientists at U.S. national laboratories have already begun using the database to design new port security scanners. The new detectors will search cargo for the fingerprints using an electron accelerator, possibly coupled to lasers that produce a finely tuned gamma-ray beam, said Craig Wuest of the Global Security Principal Directorate at Lawrence Livermore National Laboratory (LLNL). The design sounds complex, but in some ways it resembles medical scanning equipment and appears promising to pursue, he said. Howell’s “nuclear resonance fluorescence” approach is interesting because it uses a beam with lower-energy gamma rays and reduces the potential irradiation and contamination of cargo while providing “sufficient detection sensitivity,” Wuest, who was not involved in the research, added. One of Wuest’s colleagues at LLNL, nuclear physicist Dennis McNabb,is more intrigued with Ahmed’s and Weller’s technique. Scientists are only just beginning to measure the fingerprints and background signatures from this neutron-scattering process, and because “the research is in progress, how to best use the data is still an open question,” McNabb said. He also explained that cargo scanners using the data from both teams could be ready for use at ports in about 10 years.